Hov Pods fly on a cushion of air; so glide across sea, lakes, rivers, grassland, marsh, sand, snow and ice! No need to bother about tide times or slipways - turn the key and go! And if there’s no water around, no worries, you don't need water to have fun. The Hov Pod has been designed to make leisure hovercraft ownership easy, we have popularised hovercraft technology for leisure use. Until now, most small hovercraft has been limited to self-build kits and racing craft; our approach is different, we focus on ease of use, reliability, durability and safety. You don’t need to be a pilot to drive one, the Hov Pod design is so easy that after 10 minutes you will have mastered the basics. Need a demo? Want more information about Hov Pod? Follow the link and fill in your details to request information about the Hov Pod and one of our representatives will contact you and provide you with any information you need. Amazed at just how quick, simple and easy the Hov Pod is to use. Impressed with Hov Pod’s versatility and range of manoeuvres and tricks. Staggered at the ability to launch on any tide from any patch of land. Forget all about RIB’s, speedboats and other types of personal watercraft, Hov Pod is versatile and unique, it can travel over many surfaces that restrict other craft, skim from water to land and back again! Gliding through long sliding loops! Spinning in wild arcs or tight 360’s! Park up on dry land, no need to wade into cold water to recover the craft onto the trailer! A superyacht tender to lower and go anywhere on water, or straight on to land. A thrillingly different and exciting slide and glide high speed toy. A way of exploring or getting to all those secluded or inaccessible places no one else can get to. The way to beat the tides and leave home or reach a mooring at any time of day. A unique machine for fun or access over any difficult terrain such as swamps, estuaries, sandbars, flooded ground, reeds, submerged coral, ice etc. A responsive and economical rescue, survey, patrol or inspection craft. A team building, activity, adventure, charter or rental income earner. Hov Pod is an incredibly versatile, highly exciting and thrillingly different craft. The Hov Pod is manufactured in Southampton, England, by Reaction International Ltd. Company founder and Managing Director Peter Ward, established the company in the year 2000. As a marine engineer Peter travelled to many exotic destinations and pondered on the question, "Why has no one exploited hovercraft technology for the marine leisure industry?" After a number of years market research, he concluded that although there were many kit built and racing craft available, no one had designed a craft to meet the exacting standards demanded by the marine leisure market. Marine leisure buyers demand safety, ease of use, durability, reliability, and expect a dealer network capable of providing on-going sales and technical support. 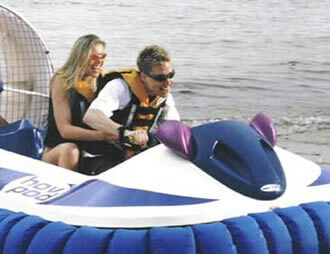 The personal watercraft market is huge by comparison to hovercraft. 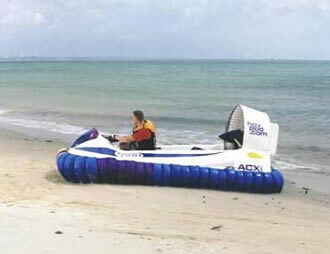 Peter set out to design a craft capable of addressing all of the known problems associated with hovercraft, for example, the perception that all hovercraft are noisy, difficult to control, are known to stop suddenly on water, (known as ploughing in), and when they do stop on water, occasionally sink! Not only would his design need to overcome these problems to meet safety standards, he also wanted the craft to look as good as personal watercraft. To reach this aim, he contracted out manufacture of specialist GRP (Glass Fibre) construction to specialist top quality boat manufacturers. By September 2002, the first craft were ready for launch at the Southampton International Boat Show, and took the world by storm. Television companies lined up to conduct interviews and test drive the Hov Pod, and queues formed as hundreds of people wished to experience the Hov Pod ride. Leading magazines and National newspapers began to feature the Hov Pod. Film companies featured the Hov Pod in science fiction and adventure movies, TV footage was syndicated around the world. Reaction International Ltd are now busy building an international network of dealers to provide sales and technical support, and have received orders from as far away as Australia, South Africa and the Middle East. The Hov Pod is testimony to the fact that if you can invent or develop a new product that fits a niche market, the world will beat a path to your door, evident by the growing demand of export orders received by the company. Need a demo? Want more information about Hov Pod then please complete this simple form and Hov Pod will contact you with the name of your local dealer.